Full-time staff members of the Children’s Advocacy Center of Susquehanna and Wyoming Counties include (above, from left) Andrea Venesky, Janine Fortney and Kimberly Tuttle. 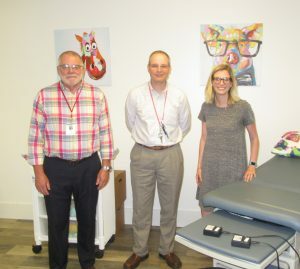 CAC trauma therapist Andrew Venesky (below, right) shows Rex Catlin (left) and Loren Stone of Endless Mountains Health Systems the medical examination room in CAC’s new facility on Ellsworth Drive in South Montrose. When physical or sexual abuse of a child is suspected, the process of unraveling the mystery can be one more frightening step for the victim. It can also be disconcerting for the parents. At the Children’s Advocacy Center (CAC) of Susquehanna and Wyoming Counties, staff members do everything they can to alleviate that stress while carefully getting to the truth of the matter. A new facility in South Montrose has given them the space and privacy to do that. “We were kind of on top of each other at the old place,” said full-time trauma therapist Andrea Venesky. Venesky now has her own office, which serves a dual purpose. A two way mirror into an adjacent room allows her to visually monitor parent child interactive therapy (PCIT) sessions while she also provides instruction to the parent via a microphone and ear bud. The youngest victims of physical and sexual assault often exhibit defiance, temper tantrums, aggressive behavior, short attention spans and other symptoms that are methodically addressed through playful activities. Older children and teens undergo trauma-focused cognitive behavior therapy (TF-CBT) that is more age-appropriate. According to Janine Fortney, program director and one of two full-time forensic interviewers at the CAC, 58 children were assessed at the facility in 2017. At 36 cases from January to June of this year, it appears that the number of clients in 2018 may eclipse those of the previous year. After a bit of a lull in the summer, the new school year will be telling. “Teachers see and hear things when the kids get back to school,” Fortney related. In most cases, suspected child abuse is reported through ChildLine (800-932-0313), a state funded abuse registry intake unit where operators are trained to interview the caller and determine the most appropriate course of action. They will contact Children & Youth Services or the Pennsylvania State Police, especially if criminal activity is more apparent. Then, the CAC is contacted and an intake visit is scheduled. CAC in turn involves either the Victims Resource Center or the Women’s Resource Center, representatives of which will be at the facility with law enforcement officials when the family arrives. “The first thing we do is give the family a complete tour of the facility, so they can see all of the rooms in advance,” Fortney explained. As the child is taken to the interview room, staff members in the waiting room advise parents as to what resources are available to them. The interview room is cozy and quiet. Three sound machines in the hallways produce white noise to prevent anyone passing by from hearing the discussion. While CAC staff and the aforementioned parties watch the process live from a room across the hall, the interview is also recorded from two cameras angles that allow investigators to gauge both the text of the conversation and body language. The recording is maintained by law enforcement as evidence. The child and their parents are brought back together in the medical exam room, which looks like the exam room in any doctor’s office, except for the colorful cartoon-like images that adorn the walls through most of the facility. Pediatric sexual assault examiner Thomasita Carlson explains to them how the exam will proceed. When the initial intake is complete, the child returns to the waiting room where he or she is given a stuffed animal, a book, and sometimes a blanket, all of which are donated to the center. Sometimes, after the case has been resolved, a child will be referred back to the CAC for PCIT or TF-CBT therapy, if the Children & Youth case worker feels that one of those two specific models is the best fit. Families are also referred to the CAC by schools when a child is exhibiting behavioral problems due to any type of trauma, such as a divorce or a death in the family. 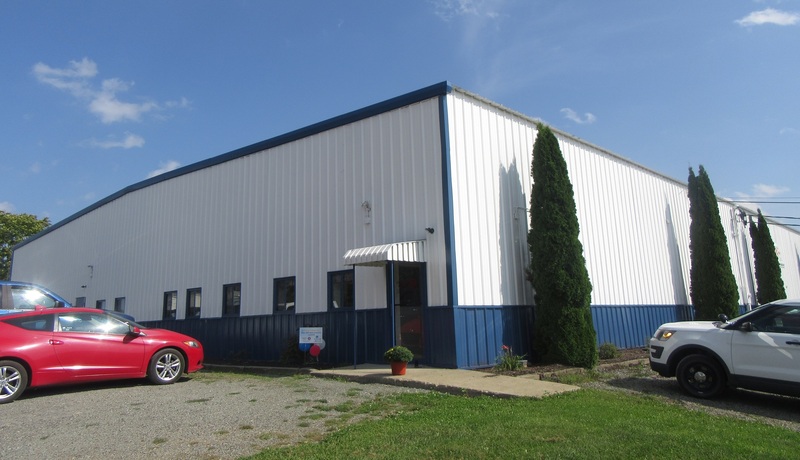 CAC moved from the Tannery building in Montrose to the new facility at 96 Ellsworth Drive in July. With all the kinks worked out and all 2,200 square feet fully functional, staff members held an open house on Aug. 28, attracting Susquehanna County commissioners Betsy Arnold and MaryAnn Warren, Wyoming County human services director Mike Donahue, representatives from Endless Mountains Health Systems and numerous other agencies that share clients and resources. The guests were impressed with the spaciousness, the privacy it offers, and complimented forensic interviewer and outreach specialist Kimberly Tuttle for the special decorating touches that make a place where such serious business is conducted more inviting for children. While the CAC in South Montrose works most closely with State Police officers from Susquehanna and Wyoming counties, Fortney invites law enforcement officials from smaller municipalities in the region to schedule a visit and tour of the facility by calling 570-823-5144 ext. 370. The CAC is funded by the United Way and the Family Service Association of NEPA. Donations are always appreciated, however, and the wish list includes clothing, snack items, school supplies, office and cleaning supplies, teen hygiene products and monetary contributions for evidence kits and other equipment.